AMMAN — Senate President Faisal Fayez on Monday discussed with Chairman of the Saudi Arabian Majlis ash-Shura (consultative council) Abdullah Sheikh the Amman-Riyadh relations and means to enhance them especially in the political, economic and parliamentary spheres. Talks also covered the recent regional developments, including the Palestinian cause and Syrian crisis, the Jordan News Agency, Petra, reported. Fayez voiced pride in the advanced level of the Amman-Riyadh ties, renewing Jordan's rejection any interference in the internal affairs of Arab Gulf states. He underlined that their security and stability are part of Jordan's national security, according to a statement carried by the Jordan News Agency, Petra. 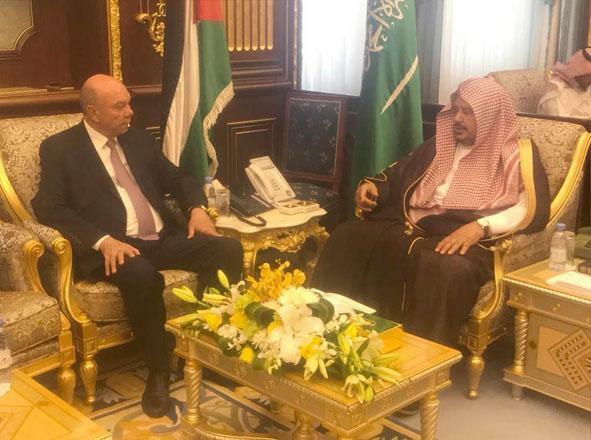 Fayez also pointed out to the economic challenges facing the Kingdom due to the regional turmoil, voicing Riyadh's assistance in this regard and calling for more Saudi investments in Jordan, according to Petra. Fayez also said that there is no alternative to the two-state solution to end the Palestinian-Israeli conflict, reiterating that there can be no security or stability in the region without a just and comprehensive solution to the long-running conflict that guarantees the establishment of an independent Palestinian state with East Jerusalem as its capital. "Jordan rejects any unilateral decision that would change the legal and historical status quo of East Jerusalem and refuses any solutions at the expense of its national values," Fayez added. For his part, Sheikh said that the two countries enjoy deep-rooted relations in all fields, Petra reported. Fayez and Sheikh signed a memorandum of understanding (MoU) that entails maintaining consultation and coordination on a number of issues of mutual concern. The MoU stipulates the formation of a joint Jordanian-Saudi friendship committee that works on fostering cooperation between the two countries, Petra reported.